Wisconsin Governor Scott Walker’s power play is bad news for the nonprofit sector, not just unions and the middle class. That’s because more than anything else it is a power play. Walker’s rhetoric is that it’s all about balancing a budget, but that’s a ploy. To understand the impact on Wisconsin’s nonprofit community, one has to look longer term at the consequences of the governor’s power move. 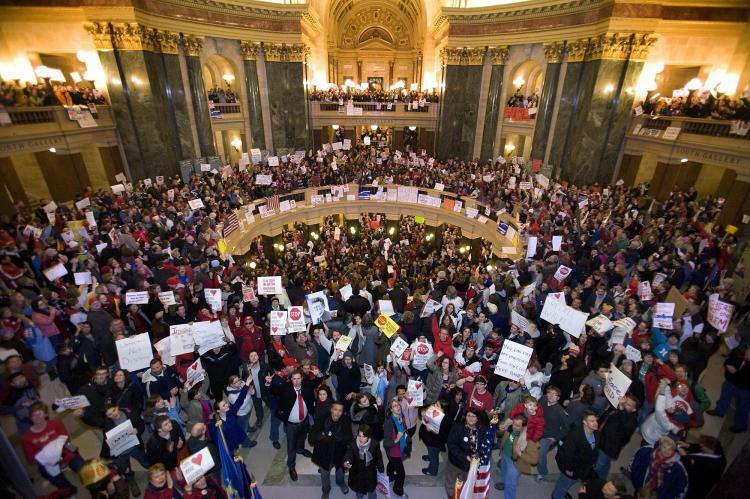 Some background: Walker launched the revolt by trying to rush through the state legislature a budget repair bill which would, among other things, effectively eliminate collective bargaining for public employees at all levels of state and local government. Public sector unions would be left only with the power to bargain over wages so long as they did not demand more than the consumer price index. Some public sector unions wouldn’t even be able to bargain for that. Contracts would be restricted to one year; dues could not be mandated and would not be taken out of paychecks. Increased payments toward health and pension benefits would have cut the average public worker pay by about 8 percent. Walker’s alleged reason for all this was the need to close an expected budget gap in the current state fiscal year, which ends June 30. But as the Legislative Fiscal Bureau – the state’s independent auditor – reported last week, less than $28 million would be saved in the current fiscal year by the moves, while $165 million would be saved by the restructuring of state bonds Walker also proposed. Meanwhile, in recent weeks Walker has enacted about $117 million in tax cuts for businesses (to take effect next fiscal year). He is expected to propose much deeper tax cuts in his upcoming proposal for the 2011-2013 budget, including additional tax exemptions for capital gains profits and for multinational corporations. So much for his concerns about budget deficits. Clearly, this was extreme fiscal overkill on Walker’s part. Fundamentally, his goal is to destroy the ability of public sector unions to represent public employees and – more importantly – to play a meaningful role in politics. And since public sector unions are now the dominant sector in the union movement, Walker would in effect have destroyed the single largest institutional base of power that could challenge his ideological drive toward minimal government, maximum privatization, and extreme reliance on the profit sector to satisfy basic social needs. To some in the nonprofit sector this might even seem like good news. Privatization could mean lots more business for some nonprofits, which would take over contracts from public employees. Union weakness would mean less likelihood of strong union efforts at large nonprofits. But the long-term consequences would be calamitous for civil society. At its root, this is a battle between two very different views of public institutions. Some – who support the unions in this –understand that public structures are essential to a healthy, prosperous economy. They understand the basic truths, that a UPS truck can’t even make deliveries to a private company or that one firm cannot trust a signed contract with another firm without a vast network of public roads, public rules, public adjudicators, public structures, public nets, public assurances, and public confidence. On the other side are those who see public institutions as inherently destructive, as something to be avoided at all costs, as an impediment to a society where people are to go through life with little to guide them except their own personal initiative and moral beliefs. This is not – emphatically not – a Republican versus Democrat issue. It goes deeper than that, though it can surface in the form of such partisan wrangling. In a world of Walker’s making, the nonprofit community would be deluged with demands from the millions who would be shut out from public institutions. In Walker’s world, the nonprofit community would be the primary safety net for all those who stumbled in the profit society. In Walker’s vision, nonprofit workers, whose compensation always trails that in the public and for-profit sectors, would see impaired work conditions even as workloads increase. In Walker’s paradise, cynicism would be enshrined as the right moral stance toward those who stumble in the profit world. In this ideological war, there should be no doubt which side the nonprofit sector is on. Jack Norman is Research Director at the Institute for Wisconsin’s Future, a 501(c)3 policy and organizing nonprofit based in Milwaukee.